A dance critic walks into an art show. 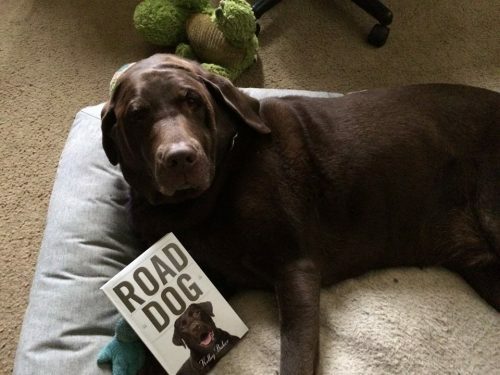 A man and his dog travel the byroads of America. A pop song sinks into a writer’s soul. A jazz pianist walks into the wilderness. 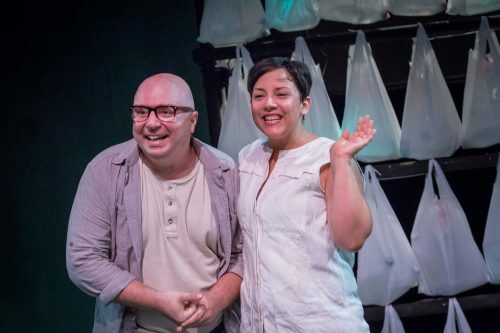 A play about a baby strikes a theater reviewer close to home. 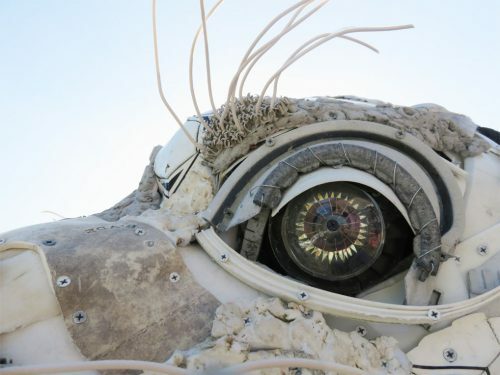 On the southern Oregon coast, artists make huge sculptures from the detritus that chokes the sea. We run a lot of stories on a lot of subjects at Oregon ArtsWatch – more than 500 in 2017 alone – and a few stand out simply as stories that want to be told. Put together a good writer and a good subject and chances are you’ll get a memorable tale. Here are a dozen such stories from 2017. 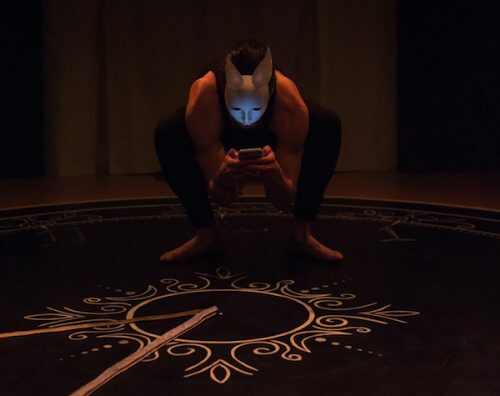 Matthew Kerrigan reinterprets Lewis Carroll’s White Rabbit, with a fleeting attention span ruled by a smartphone. Feb. 19: “There are many ways to look at art, all kinds of art, depending on your experience, your history, your knowledge, your point of view and your passions. Personally, and professionally, I am always interested in the links between dance and visual art, which are many and varied and not always obvious.” Dance critic Martha Ullman West took a tour through the Portland Art Museum’s exhibition Rodin: The Human Experience with dancer Gregg Bielemeier, who danced around some of the sculptures, and museum docent/former dancer Carol Shults, who knew the pieces inside out. It was an exhilarating foray into the ways that the artistic impulse leaps across disciplines. 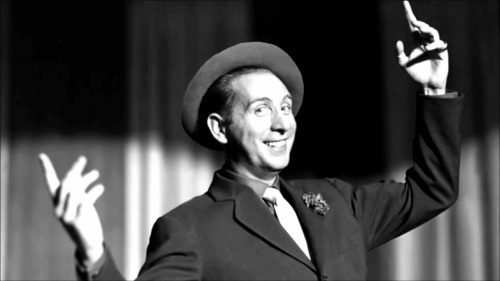 Charles Trenet, chanteur and songwriter, sang of La Mer. March 17: “Bobby Darin’s album That’s All was released in 1959 when I was five years old,” Stephen Rutledge wrote in a remarkable personal essay. “After the Original Broadway Cast album of My Fair Lady, it was my favorite LP during my pre-Beatles grade school years. That’s All opens with Darin’s famous version of ‘Mack The Knife.’ But the second track always stopped me dead and filled me with a wistfulness that I could barely grasp as a kid. That song was titled ‘Beyond The Sea,’ and although it was a swingin’ tune, it somehow broke my young heart, which was a brand new sensation. It frightened me as well. I loved it.” The song – in both Darin’s rendition and its original French version, Charles Trenet’s ‘La Mer’, has stuck with him through thick and thin, in good times and very bad, even death-defying ones: A song can have powers almost impossible to comprehend. March 6: “In March of 2016, President Obama lifted restrictions on travel to Cuba by individuals for ‘people to people’ educational trips,” Samuel Eisen-Myers wrote. “I quickly started planning a way to take advantage of this sudden crack in the wall separating us from the island and its people. … After a week in Havana, my path finally emerged from a series of chance encounters with Cuban artists and their friends—I was going to Galeria Taller, an artists workshop in Matanzas, a city of around 150,000 on the north coast of the island, less than 60 miles from Havana.” What he found there was a thriving, open community, making art and greeting people in its own fascinating ways. 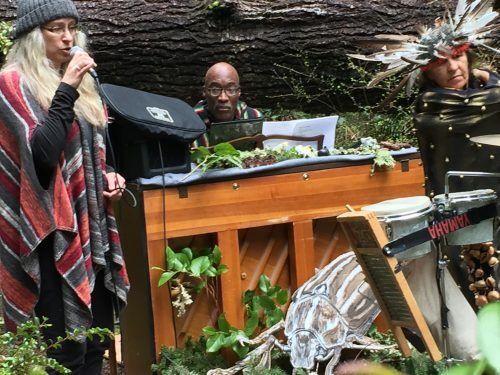 April 10: Lynn Darroch went into the woods with Portland pianist Darrell Grant as Grant and friends performed amid the trees in the Elliott State Forest on the southern Oregon coast – 82,500 acres of protected land that the State Land Board, tasked with raising money from it for Oregon schools, was set to sell off. Darroch wrote: “Grant wanted to find out if art can influence that decision.” He had other reasons, too, as he told Darroch: “As a person of color … I want the Land Board to know that this is my forest too … as much my legacy to future generations of Oregonians as anyone’s. And, as much as Oregon’s underserved children deserve a quality education, they also deserve to retain their rights to their forests.” Did the concert make a difference? Jazz or no jazz, the land-sale plan hit a snag, and what had seemed a done deal unraveled: In July, state legislators voted to block the sale. 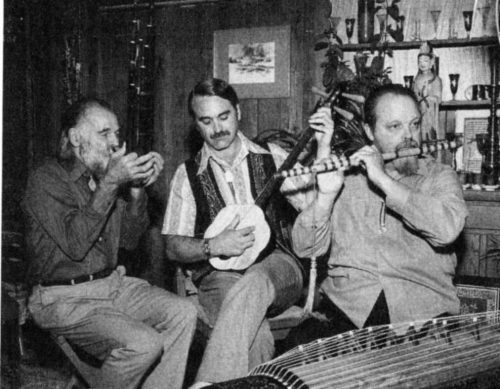 Lou Harrison (right) and unidentified fellow musicians. 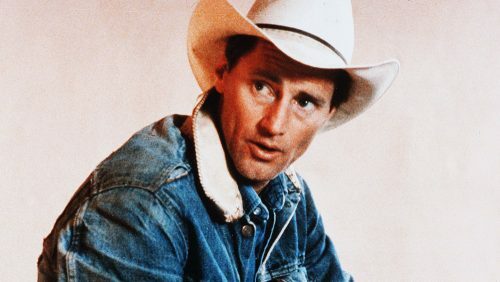 Sam Shepard in the halcyon days. Aug. 3: “Motorcycles would vroom into the massive parking lot at Fort Mason Center in San Francisco, a former Army facility being transformed into an arts complex,” Misha Berson wrote. “And if I looked out of the right window from my warehouse office, I’d see Sam Shepard roaring into the parking lot alongside John Lion, the artistic head of the Magic Theatre.” It was the late 1970s, and “Sam was so cool he could’ve been an extra from the iconic hipster film Easy Rider.” But he was in the process of becoming perhaps the crucial American playwright of his generation, and Berson was there to see it happen. After Shepard died at age 73 on July 27, Berson remembered, and wrote. Aug. 8: “Saturday night we’re driving over the Fremont Bridge, wedged into the tensing shoulder-to-shoulder traffic that is now everyday for Portlanders,” Christa McIntyre wrote. “We’ve left an hour before showtime, and it’s just enough. I get a sinking feeling in my gut as we puzzle through the chaos of cars. We can’t see the West Hills, and on the right a large plume of smoke gathers and pipes into the atmosphere from the direction of St. Johns. Another fire bellows on the Willamette River Superfund site. The river has skim paths between the liquid and the pollution top. It’s like the puddles you jumped in with your Wellies as a kid, marveling at the rainbow hues dancing between the breaks you make, not knowing the colorful patterns come from car oil.” McIntyre and her partner were heading for CoHo Theatre to see Lungs, Duncan Macmillan’s play about the anxieties of a couple facing the prospect of parenthood at a not-so-young age. McIntyre could relate. As things turned out, this one was personal. 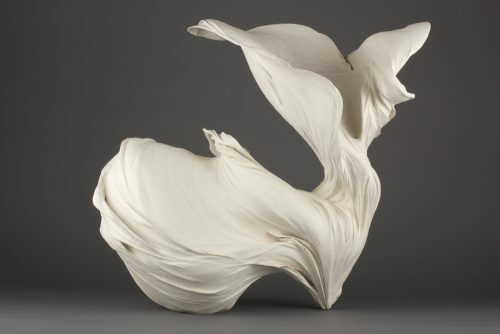 Sept. 3: “Last month, as my wife and I entered Oregon on a cross-country journey, we wandered into what initially looked to be an unassuming art gallery in a little southern Oregon coast town,” David Goldstein wrote. 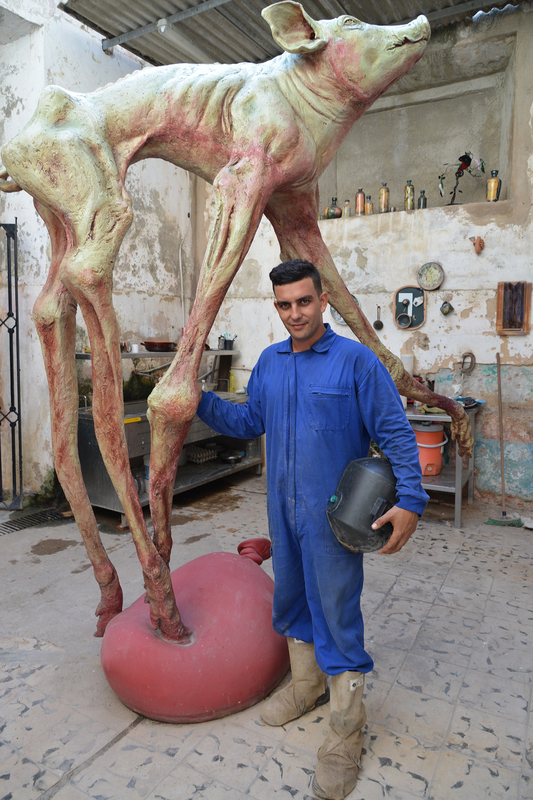 “Huge sculptures filled the space. We looked at them closely — and suddenly realized that each was made from thousands of pieces of trash. We had stumbled upon the Washed Ashore Project gallery in Old Town Bandon-by-the-Sea.” Bandon artist Angela Haseltine Pozzi, he learned, had assembled an ambitious project to take plastics and other detritus that were choking the ocean and turn them into community art. “More than half the world’s sea turtles have eaten plastic, and partly as a result, almost all of their species are threatened or endangered,” Goldstein wrote. “Other sea animals become ensnared in discarded fishing line, six-pack can holders, and other debris — more than 300 billion pounds of it, clogging Earth’s oceans and killing its creatures.” Washed Ashore is one small way to draw attention to that vital fact. Artist Perry Johnson at Oregon Supported Living Program in Eugene. Nov. 16: “Eugene artist Perry Johnson has a gift,” Rachael Carnes wrote. “His work is inquisitive and multidimensional, at once rooted in a folk art tradition while branching out towards something more visceral and visionary. Employing color, shape and text, Johnson’s pieces are composed, developed and hauntingly autobiographical. 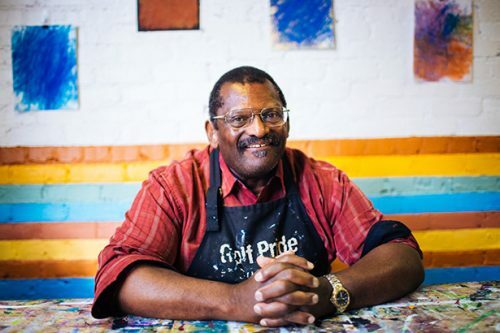 When I first meet Johnson, he’s in the art studio at the Oregon Supported Living Program’s Arts and Culture Program, an old brick building on Lincoln Street by the train tracks where Johnson accesses free art classes every day the studio’s open. 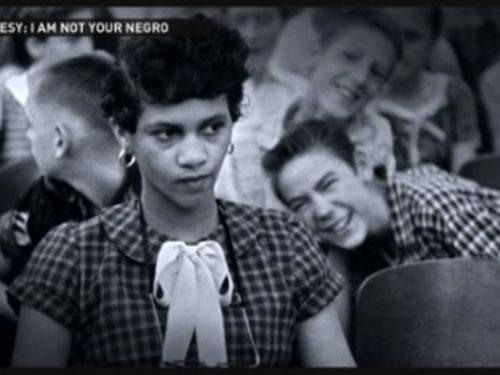 He’s working on a drawing of a photo from a magazine, of a snake wrapped around a man’s neck. ‘Python,’ Johnson tells me, pointing to the animal.” Carnes spun the fascinating tale of an outsider artist who overcame steep odds and now has his work on view at the Portland Art Museum.